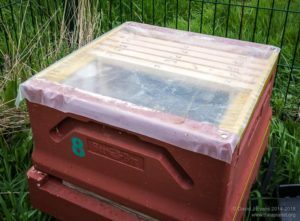 Prompted by the first hard frosts of the year and the end of the beekeeping season, here’s a post that is of only peripheral relevance to beekeeping. 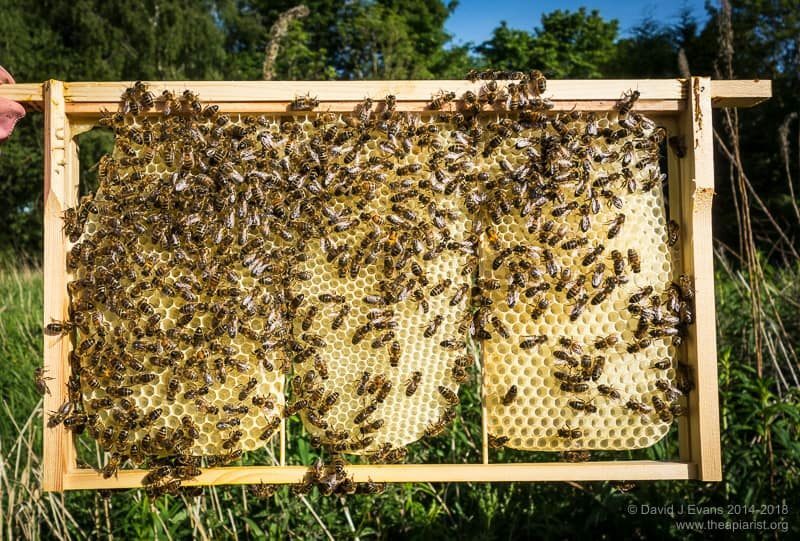 Though since you presumably prefer to eat honey on something, rather than on its own, it’s not completely irrelevant. 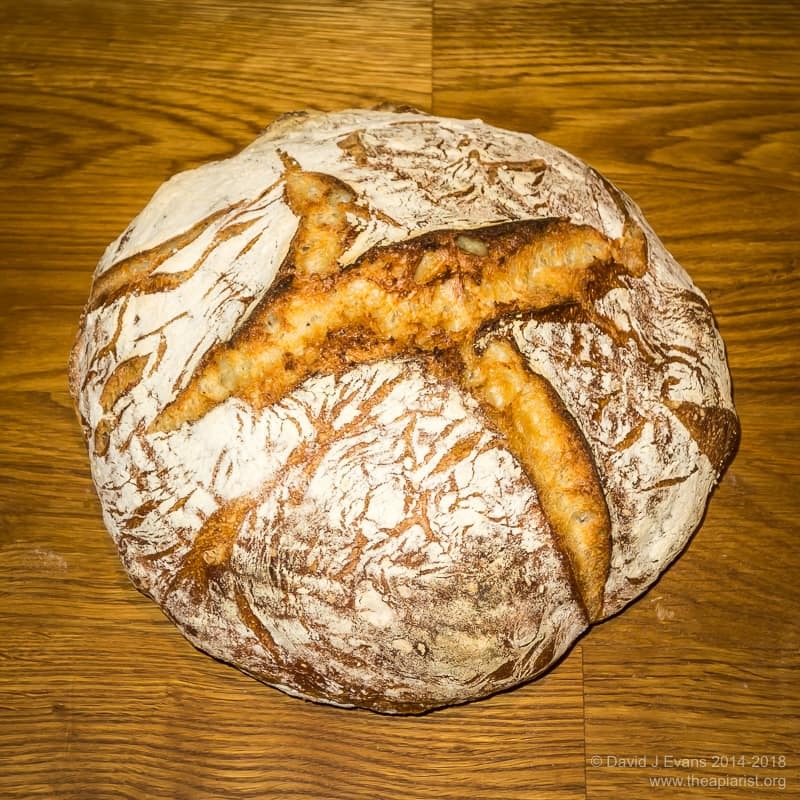 Almost two years ago I wrote a post about breadmaking. In the intervening period I’ve baked a lot more bread … probably over 100 loaves. Almost exclusively I’ve been working from an outstanding book by Ken Forkish entitled Flour water salt yeast. Forkish is an artisan baker from Portland, Oregon. 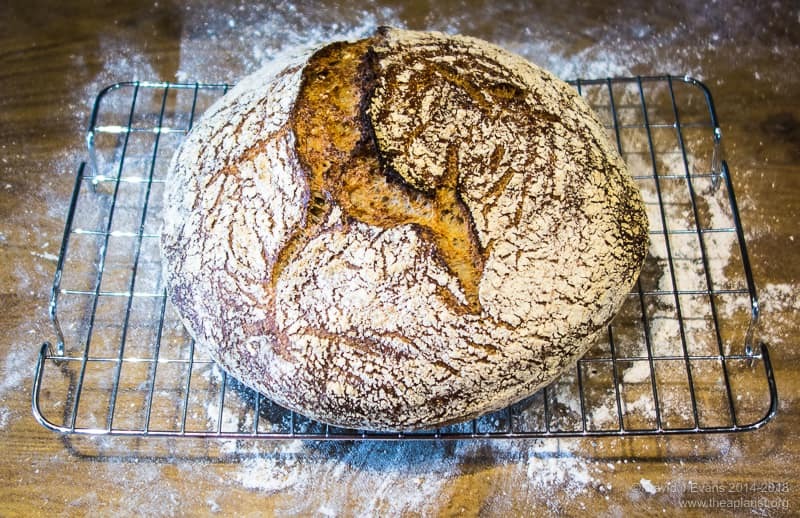 The book, and his YouTube videos that accompany it are an excellent introduction to simple, easy and quick 1 methods for producing truly spectacular homemade bread. 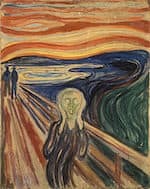 Man cannot live by bread alone … well, I’m not so sure. This bread is really good. Forkish earns his living writing and baking, so I’m not going to reproduce his recipes here – buy the book (or look for them online as some people have splurged them all over the internet). What I will do is qualify some of points in the list above. 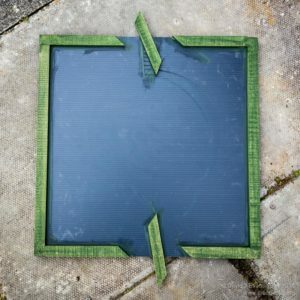 Hopefully this will encourage you to have a go as well (and to learn from the few mistakes I made by either trying to cut corners or not reading the instructions). The flour you use has a big influence on the characteristics of the dough. I almost always use Bacheldre organic stoneground flours. These are strong, absorb water well and have a high protein content. 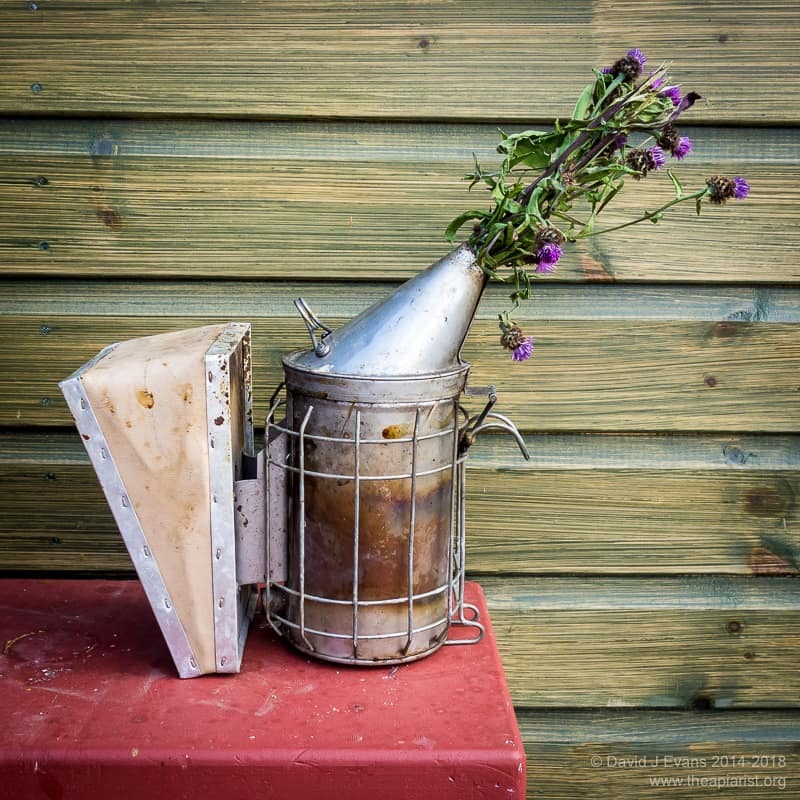 They’re available direct from Bacheldre Mill and lots of places online. In my experience, the own-brand ‘strong bread flour’ sold by most of the supermarkets make a much sloppier dough than the Bacheldre flours. The resulting bread isn’t necessarily worse, but the dough is a lot harder to work with as it’s always trying to escape. I use a thermometer to check the water temperature at the start. This ensures a uniform early development of the dough. I also check the temperature of the place I’m going to allow the dough to develop. If it’s much warmer or cooler than expected you might need to modify timings. One of the attractions of the breadmaking method promoted by Ken Forkish is that it involves very little work. For a standard loaf it probably takes no more than 8 minutes of mixing in total, in four blocks. And that includes rinsing your hands before and after working the dough. All of the mixing is done in a large container. A 30lb honey bucket is ideal. The flour and water are premixed to make an autolyse. This is allowed to sit for 20-30 minutes before adding the yeast and salt. Most of the recipes use very small amounts of yeast (much less than a gram for a 500g loaf) so the small, accurate scales used for weighing your oxalic acid (er, Api-Bioxal) are ideal. After mixing the dough is allowed to develop with a further 2-3 quick ‘turns’ in the first 90 minutes or so. These ‘turns’ aren’t even really mixing. You just fold the dough over two or three times. It takes as long to write it as it takes to do it. The following morning you turn the dough out, shape the loaf and allow it a final rise while the oven heats to a ‘serious-risk-of-burning-if-you-touch-anything-without-very-thick-oven-gloves-on’ 240°C 2. As well as preheating the oven you also preheat the container you’ll cook the bread in. I use a Lodge 3 litre cast iron Combo Cooker (or Dutch Oven for convenience). These are $56 in the USA, or an uncompetitive £90 in the UK. Any heat-retaining covered ovenproof container should be suitable. Cast iron is probably best. The goal is to trap the steam inside while the bread cooks to give the crisp crust. As an alternative to the Lodge Dutch Oven I’ve also used a large Pyrex ‘chicken brick’ which work almost as well. Cooking takes 30 minutes with a further 15 minutes uncovered to crisp up the crust. From start to finish a loaf takes about 16-18 hours. However, during that period you’re only actually handling the dough for about 10 minutes. Almost all the time is a long overnight rise period while the yeast works its magic 3. The resulting loaf tastes excellent, with a very crispy crust and wonderfully textured crumb. Since the yeast has worked hard overnight the crumb is full of large holes (which conveniently fill with honey or butter or marmalade). Assuming it’s not devoured when still warm it keeps well. If anything, the loaf improves if allowed to cool properly before scoffing 4. Once cold, just wrap it up in a plastic bag and you can use it up to 48 hours later, or perhaps longer as toast … though it never lasts that long in our house. 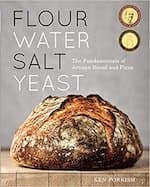 The book Flour water salt yeast has about a dozen different bread recipes. Almost all use essentially the same steps I’ve outlined above. Some use an overnight starter (a biga or poolish) and these take a little bit more work, and a bit more time. Actually, with the exception of the ingredients, quite a bit of the book is rather repetitive as the mixing and cooking instructions are essentially the same for all the loaves. The second part of Flour water salt yeast covers the preparation and use of levains or sourdough starters. These also make great bread, but take more work. With travel and other commitments I can’t always keep the sourdough starter in tip-top condition, so all of the comments here (and for at least half the book) are for loaves made with freeze-dried yeast. For a standard weekend loaf you can’t go far wrong with a standard overnight white loaf, or a 10-30% overnight wholemeal loaf. 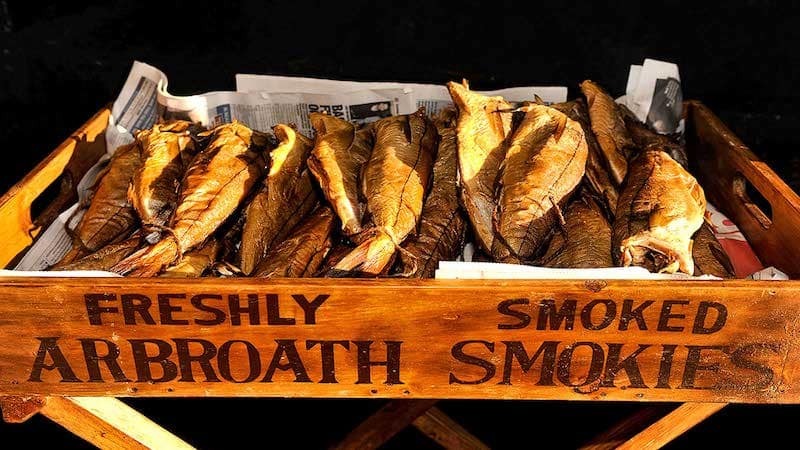 These can be started on Friday evening, cooked early on Saturday and enjoyed all weekend. Forkish explains each of the individual steps in the breadmaking process in a series of short YouTube videos. Of the 11 on his breadmaking 5 YouTube channel, the first 8 are relevant to loaves made without a levain, or sourdough starter. Watch them in sequence, ideally with the book to hand, and you’ll appreciate just how simple the process is. 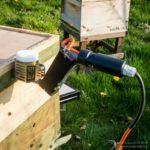 This entry was posted in Beekeeping, DIY, Hive products, Honey on November 2, 2018 by David. The poor cryptic crossword clue in the title of course refers to an eke. 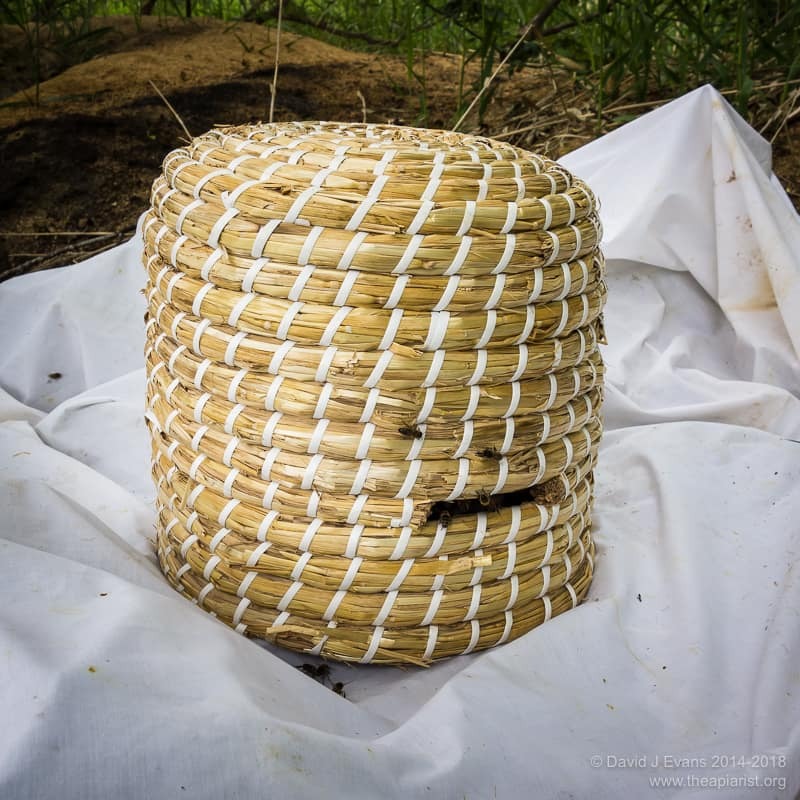 In beEKEeping, an eke is a wooden frame, the same dimensions as the hive, used to provide temporary additional volume to the hive. 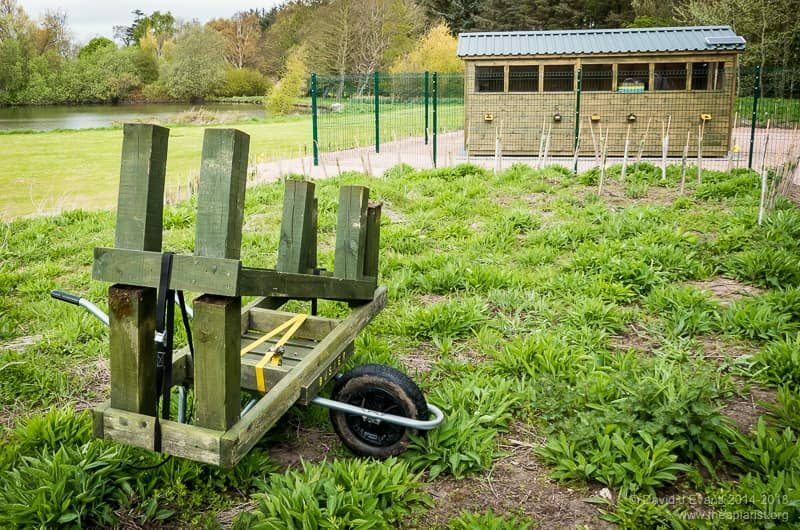 They are useful and versatile pieces of equipment. The word eke can be traced back to Middle English (eke or eake) when it meant “an addition” and was derived from the the Old English (ēaca) and the Old Norse (auki) words of the same meaning. In Old English it usually referred to a reinforcement of troops, but in 1549 it was first used 1 to indicate an addition to the tag end of a bell-rope. 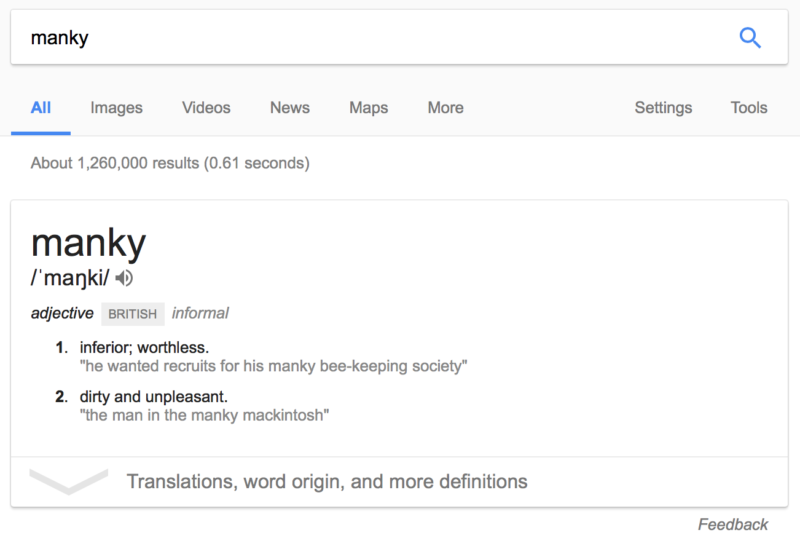 And then, a mere 308 years later it was used to describe a cylinder on which a beehive was placed to increase its capacity. ‘Cylinder’ of course, because in 1857 most beehives were probably still straw skeps 2. 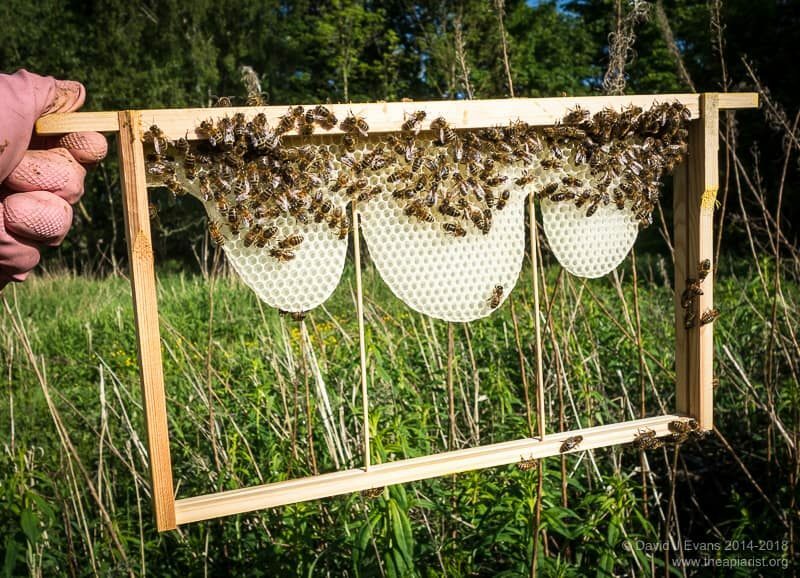 A more extensive definition from the same period was a small addition to the bottom of a beehive, often just a few strands of straw, on which the hive was temporarily raised. 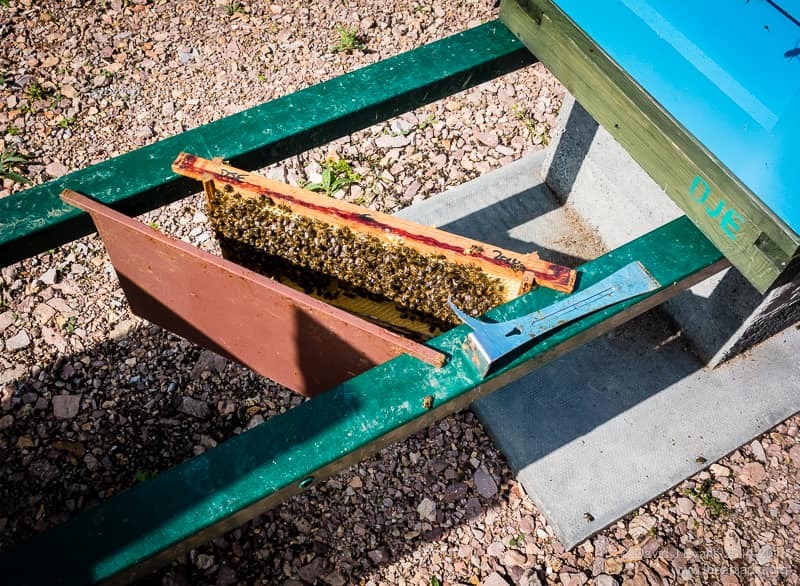 Most of us don’t use skeps any longer (other than for swarm collection) but we do use ekes. 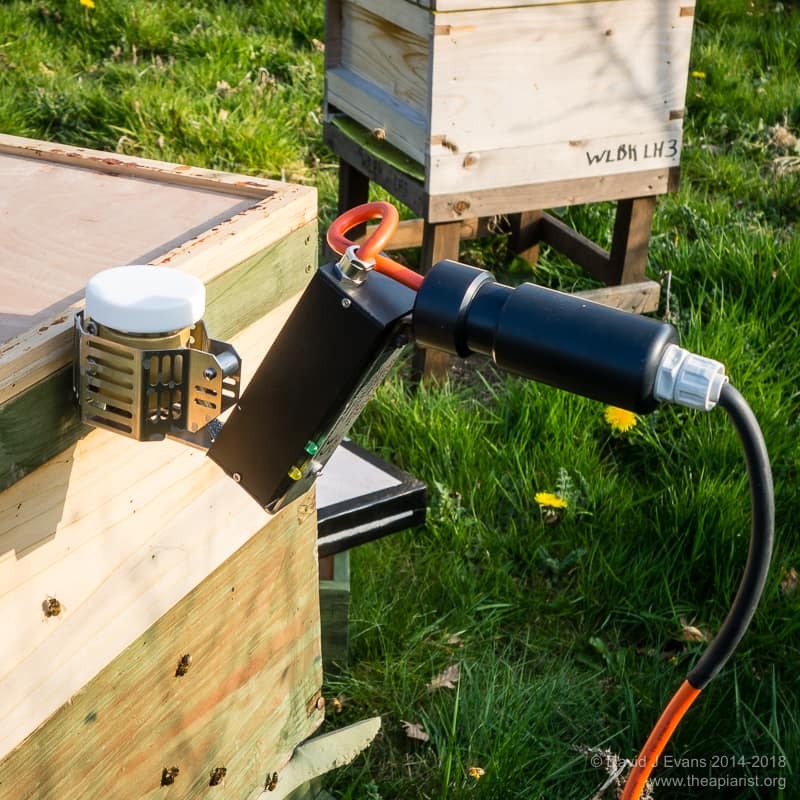 For some time I’ve reckoned that the appropriately-named dummy board represent the single item with the largest profit margin for manufacturers of beekeeping equipment. I’m wrong. It’s the humble and unassuming, but oh so useful, eke. 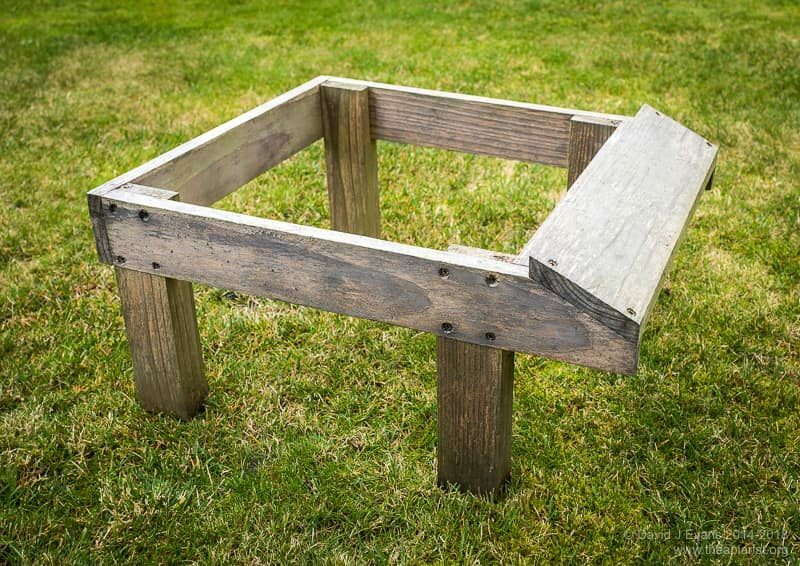 At its most simple, an eke is a made of four bits of wood, screwed, nailed or glued together at the corners, square 3 and true. It doesn’t need to be made out of the best quality cedar. In fact, it doesn’t need to be made of cedar at all. 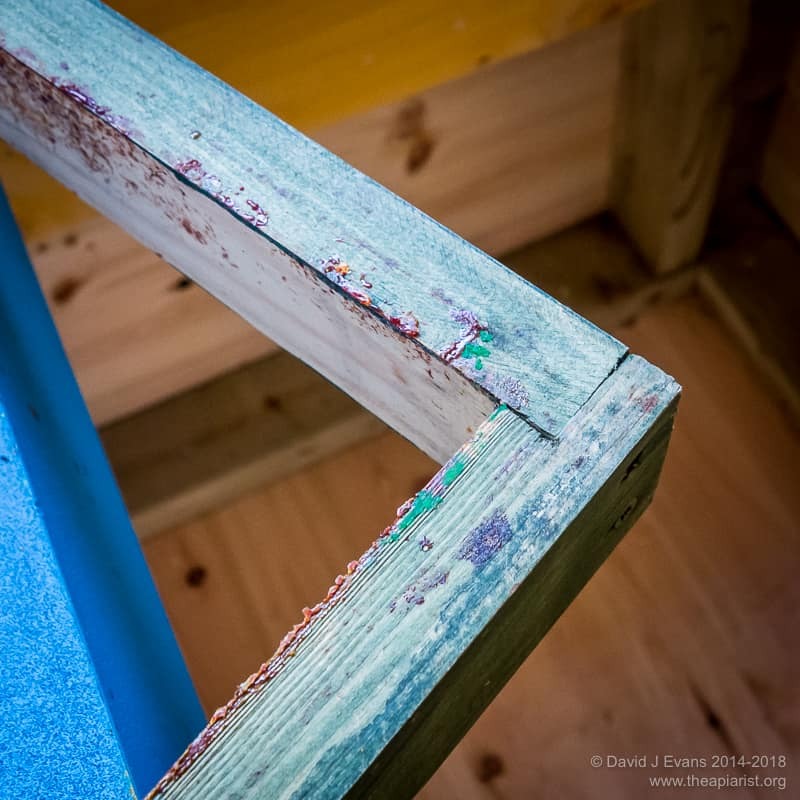 Any readily-available softwood with a couple of coats of wood-preservative slapped on top will be just fine. 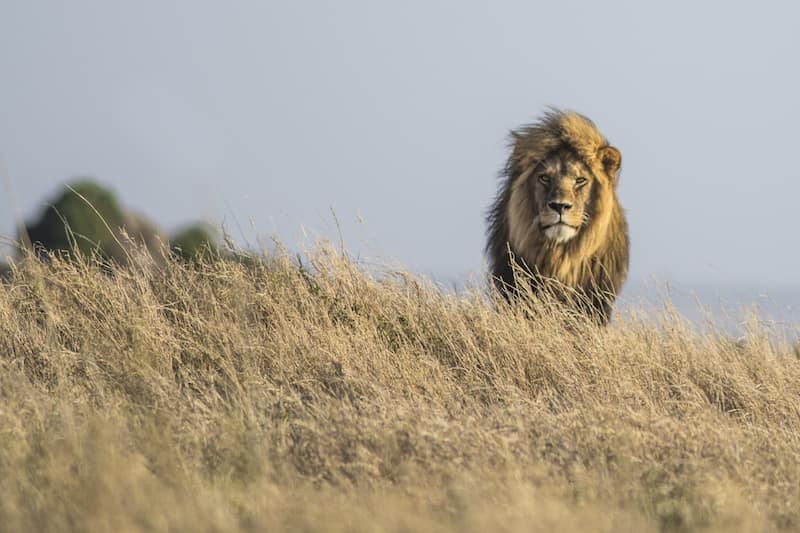 Look back at the definition of an eke. 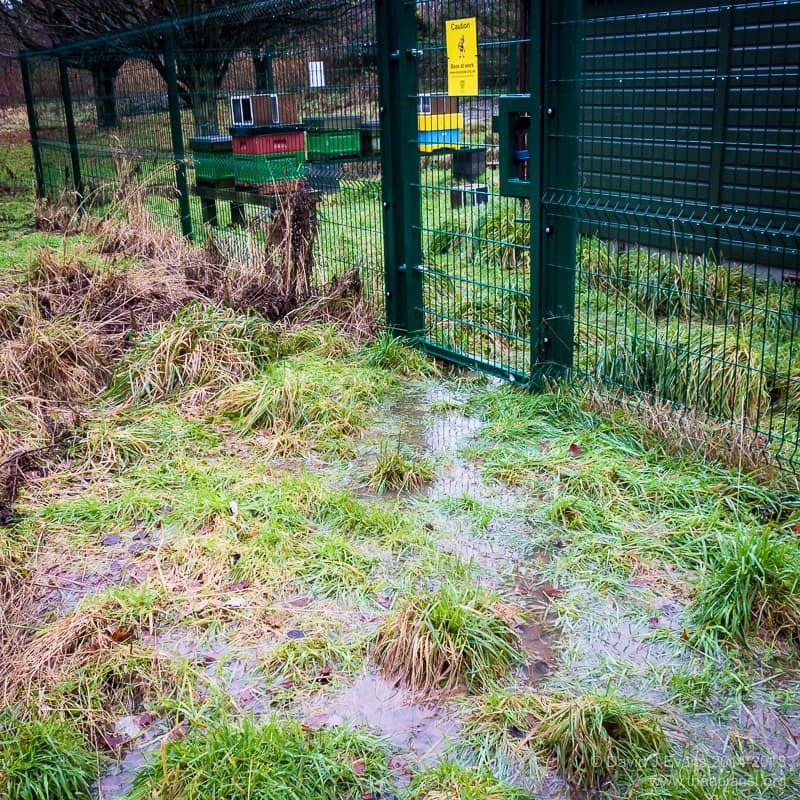 Now, as in 1857, it was meant as a temporary addition to the hive. Cuprinol is just fine, best western cedar is overkill. No … rabbet. R a b b E t.
I shall leave the precise design and details of building an eke as ‘an exercise for the reader’. You can achieve ‘square and true’ by using a simple square of plywood as a template. I’d suggest gluing and screwing the corners using a simple rabbet joint. 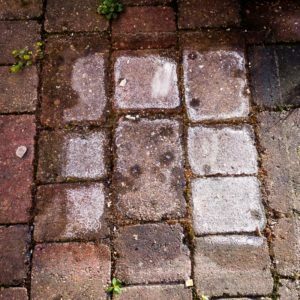 Paint the entire thing with a couple of coats of bee-friendly wood preservative and you’ll have saved at least £20 on the prices some of the commercial suppliers charge. 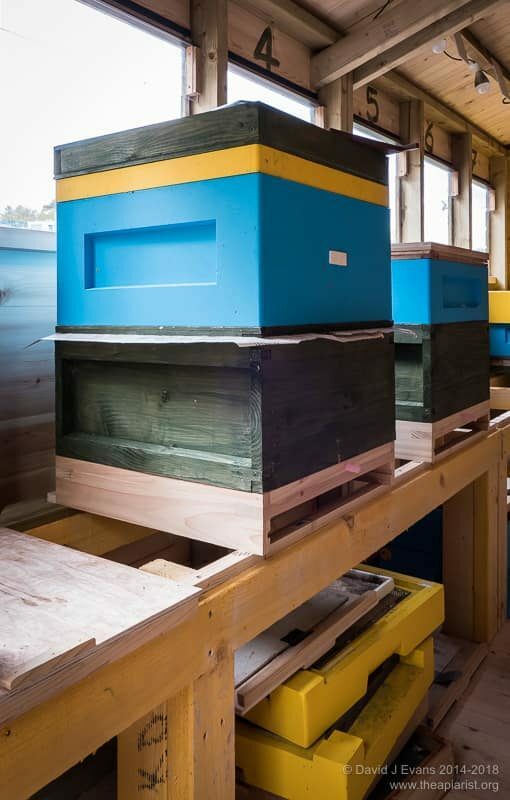 Length and width are the same as the hive, depth is the important one. You can make an eke any depth you want. You can usually buy them in only two depths. 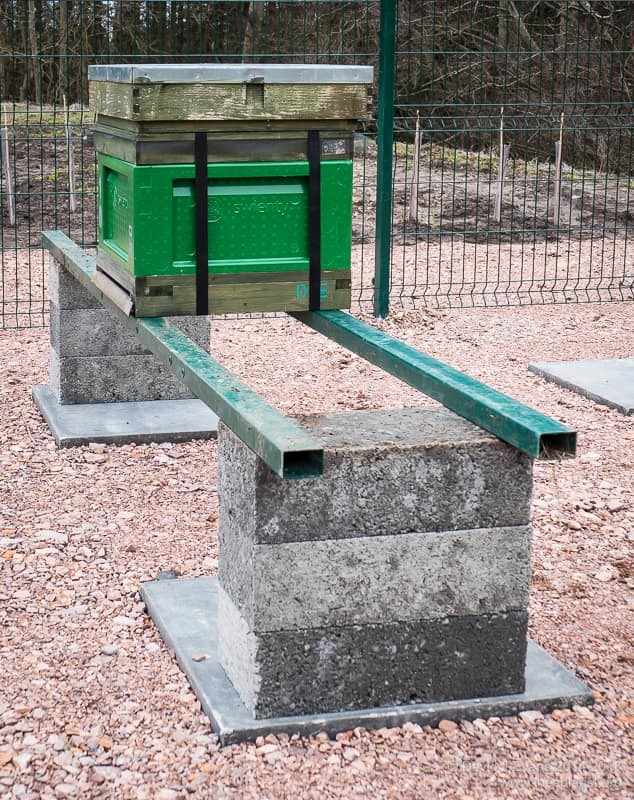 Shallow (~20mm) – to provide just enough space over the brood frames when applying Apiguard treatment in the autumn. I can’t think of alternative uses that need an eke this shallow. Deep (~90mm) – to convert a regular brood box for use with 14 x 12 frames 4. All my ekes are made from 20 x 44mm (thickness x depth 5) softwood. This just happened to be the wood I could easily get when I first started building them, but has turned out to be a very useful depth overall. Build more than one. Unless you only have one hive. 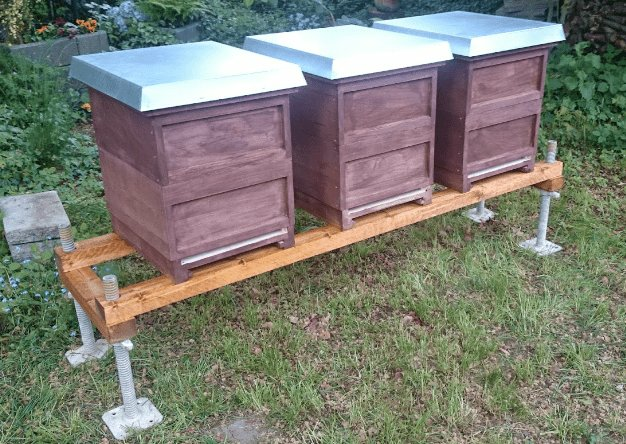 In which case buy another hive and then build another eke. 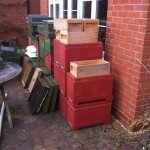 I’ve got about two-thirds the number of ekes as I have hives and I regularly run out. 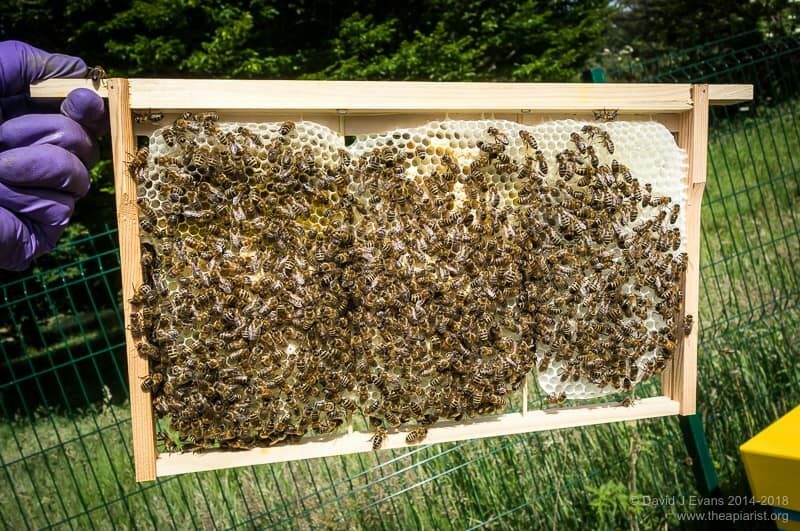 The most frequent use for an eke is to provide space above the frames and below the crownboard, for example when feeding a colony fondant or applying Apiguard. It takes just seconds to lift the roof and crownboard, position the eke, add the fondant or tray of Apiguard and cover the hive again. In the days when I used to use Apiguard I’d often add the fondant at the same time 6. What could be simpler? 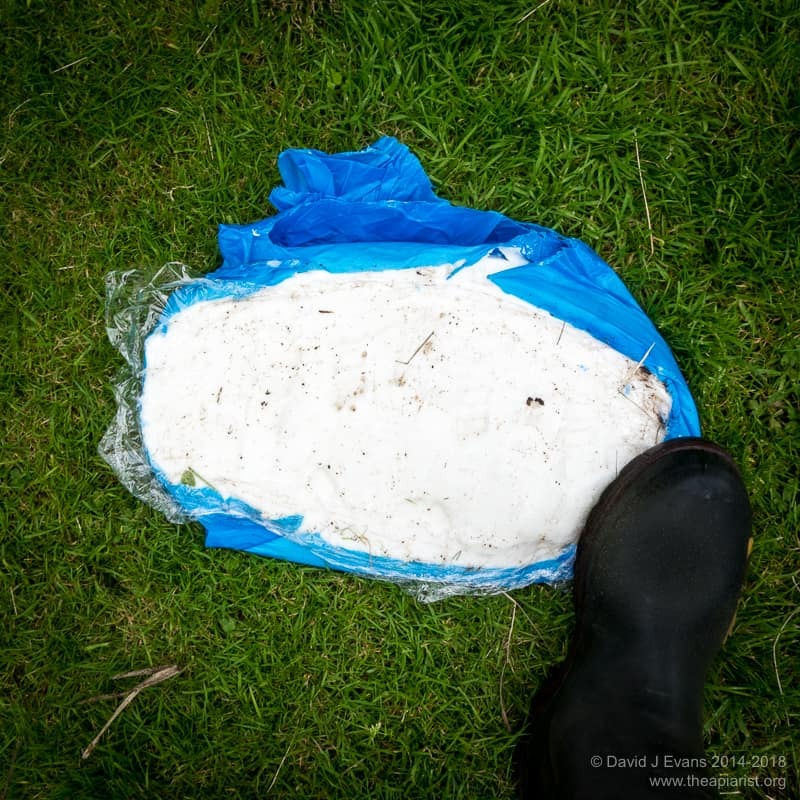 With care (or a lot of flattening the block by standing on it repeatedly) it’s possible to easily squeeze 6-8kg of fondant into the void provided by a 43mm eke. Since I usually feed a full 12.5kg block of fondant in one go – sliced in half and opened up like a book – I simply pop an eke under an inverted insulated crownboard to provide the ‘headroom’ needed. 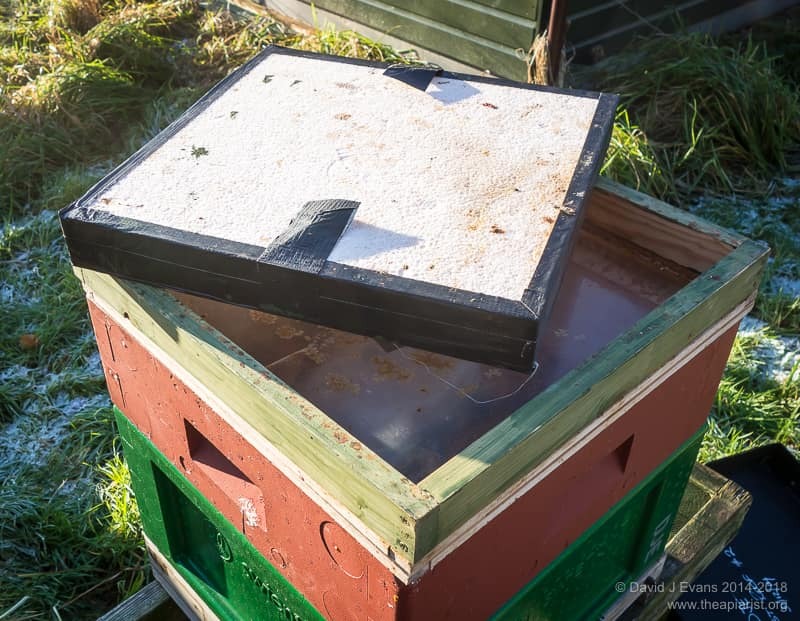 Whilst we’re on the subject of applying miticides … I also use ekes when administering vaporised oxalic acid-containing treatments to colonies in polystyrene hives. The nozzle of my Sublimox vaporiser gets hot enough to melt polystyrene. 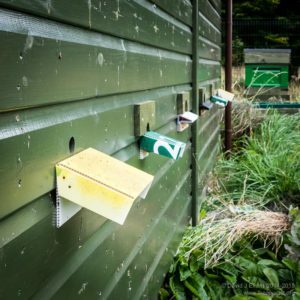 Rather than messing around trying to aim the billowing cloud of vapour through the entrance it’s much easier simply adding a wooden eke to the top of the brood box and pushing the nozzle through a 7mm hole in one side. 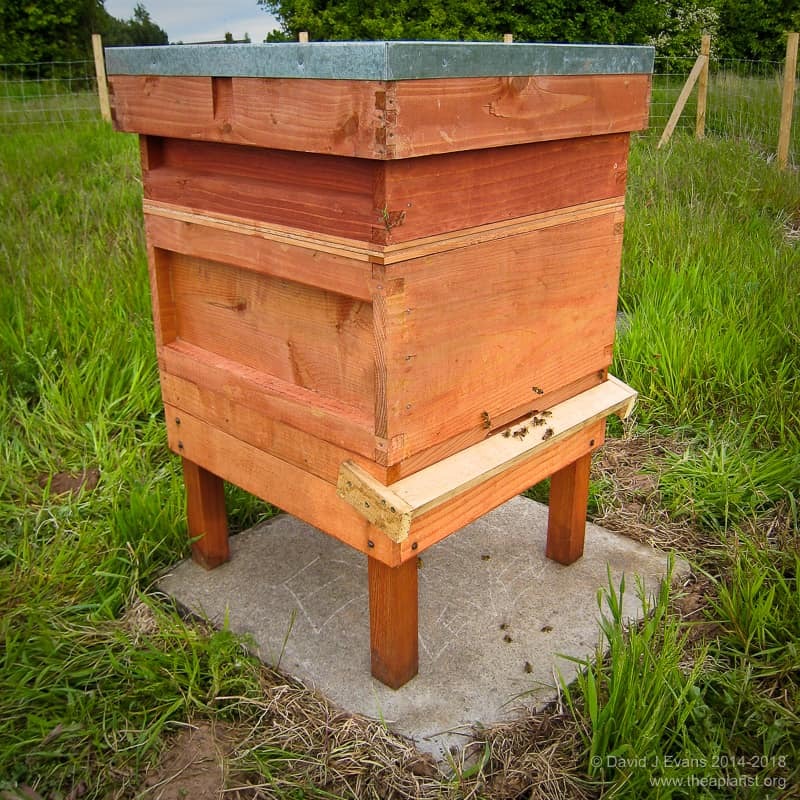 The vapour easily permeates to every corner of the hive 7. 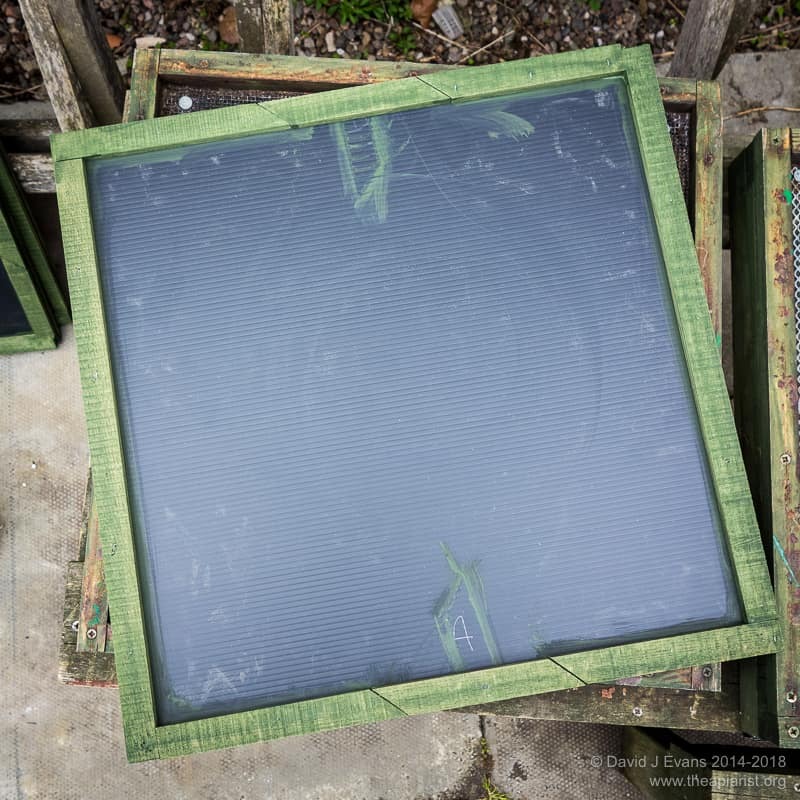 Travel screens are used in place of crownboards and roofs when colonies are being moved any distance. 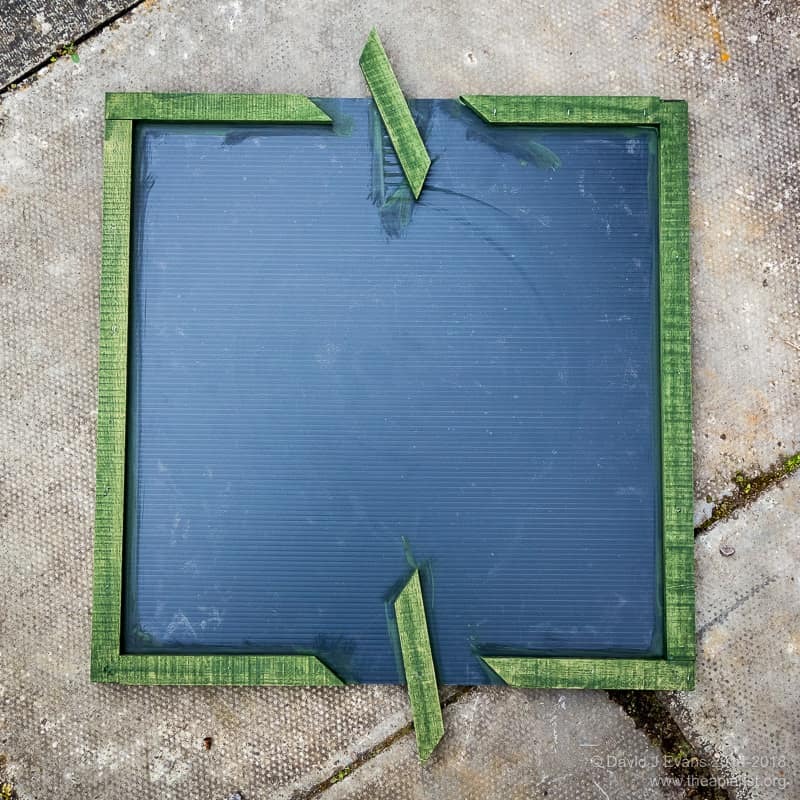 They are usually framed wire mesh of some sort. 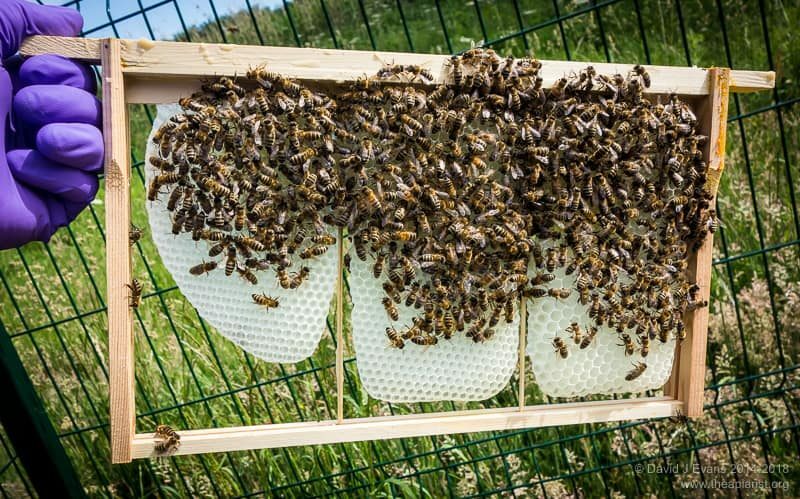 They are important as they stop colonies overheating during the stress of transporting them. 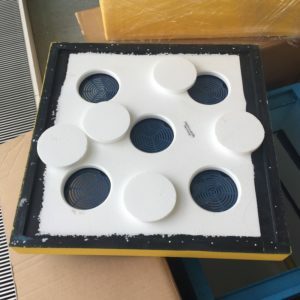 You can also easily spray water onto the colony to help cool it if needed. 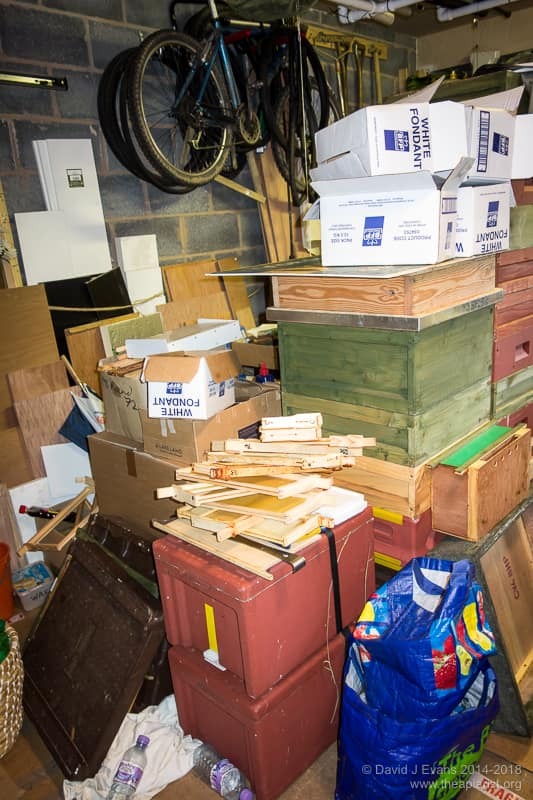 They are yet another thing that spends 98% of the time stacked up in a corner with all the other oddities of beekeeping – clearer boards, Miller feeders, weirdo split boards and custom-made shims for uniting mismatched hives. 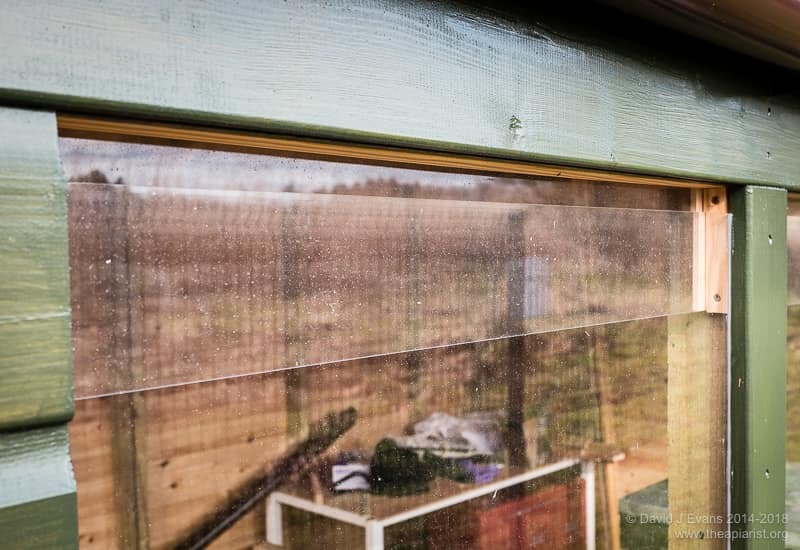 I don’t bother with travel screens, but instead use robust ‘glassfibre’ insect mesh held securely in place with – you’ve guessed it – an eke. 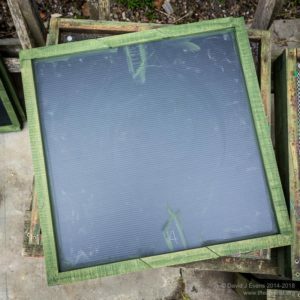 I just lay the mesh over the open colony, add the eke and then strap everything thing up tight. This works a treat. 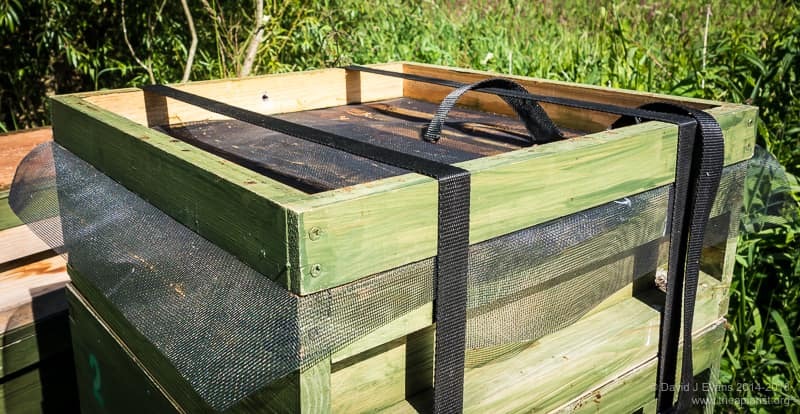 The eke ensures that the mesh is held securely around the edges. 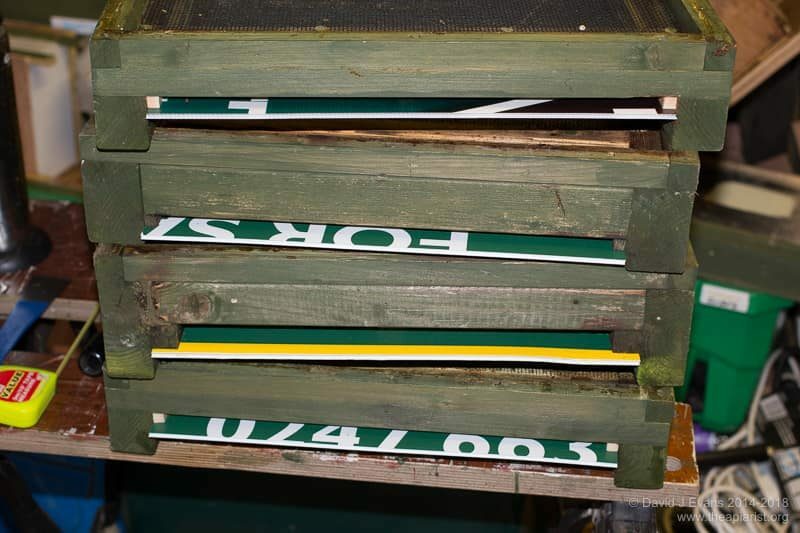 I’ve also bought, inherited or otherwise acquired several standard framed plywood or perspex crownboards. 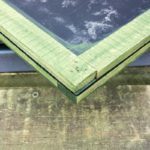 Using a 44mm deep eke and a suitably sized block of 50mm thick expanded foam you can easily cobble together a perfectly function insulated crownboard. 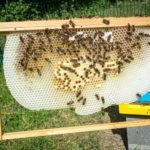 There are all sorts of additional uses for ekes … stacking supers on, providing space under brood frames with protruding queen cells (for example, when moving a frame from one colony to another 8, doubled up to provide depth for 14 x 12 frames etc. 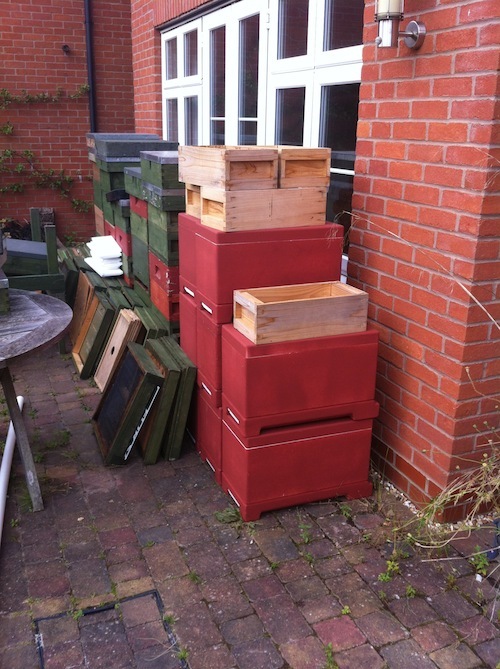 It’s worth keeping a couple of ekes stacked up with spare supers and broods in the apiary. 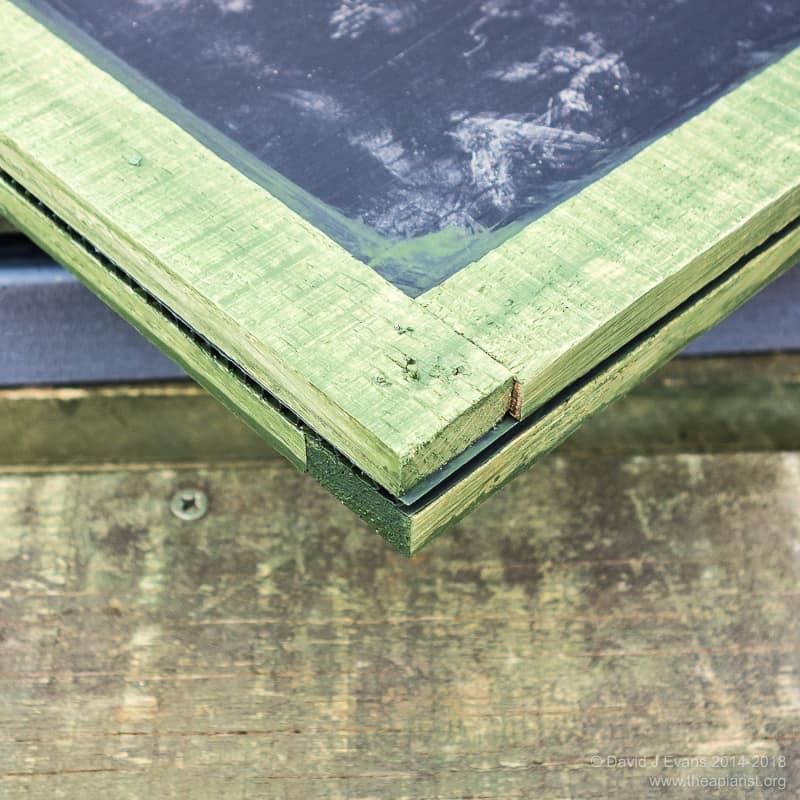 They’re more useful than you’d think a simple square frame of wood should be. 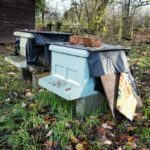 This entry was posted in Beekeeping, Boards, DIY and tagged eke, feeding, miticide, skep, travel, travel screen on January 19, 2018 by David. 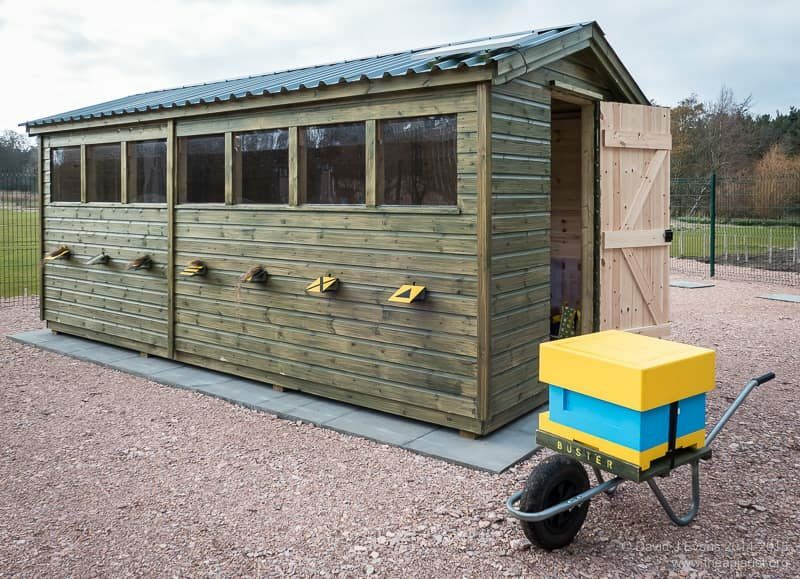 I recently spent an enjoyable evening giving a talk to the Edinburgh and Midlothian Beekeepers Association. 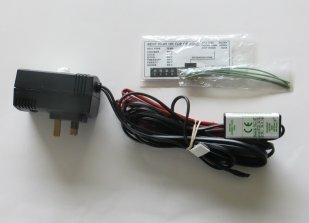 In questions after the talk I was asked where to buy the Ecostat heating element used in my honey warming cabinet. It’s not always listed on the website of the suggested supplier, Patrick Pinker (but is as I write this). 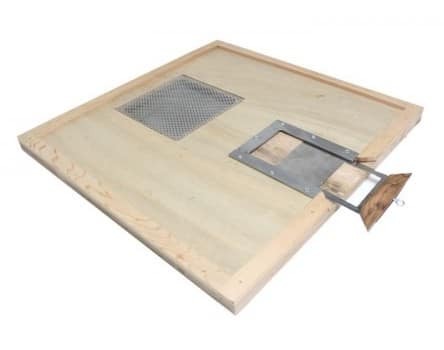 These incubator elements are usually purchased be people rearing chickens or gamebirds. 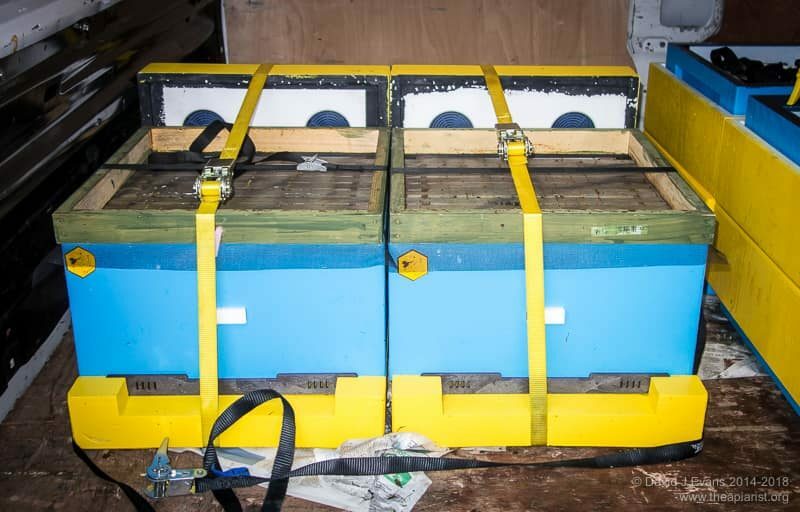 An alternative supplier listing Ecostat kits in 50 and 100 eggs sizes is Strangford Incubators in Northern Ireland. 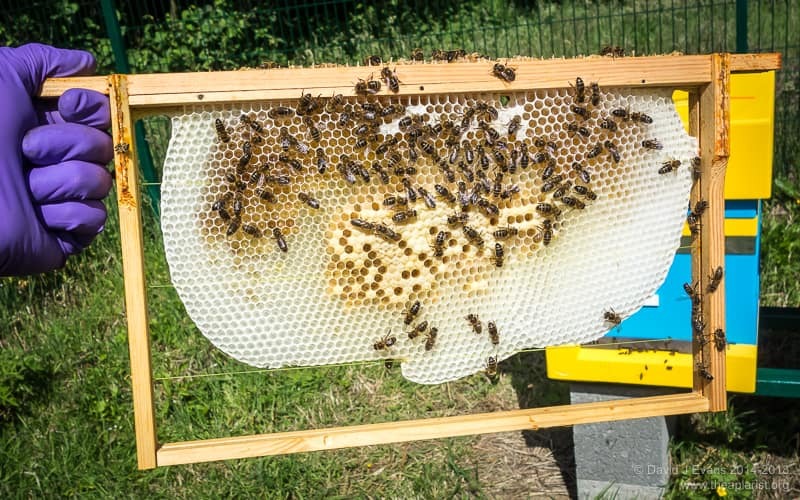 You will almost certainly need the 100 egg size to generate enough heat to melt OSR honey properly. 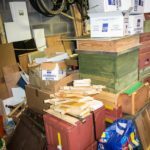 This entry was posted in Beekeeping, DIY, Honey, Tools on February 22, 2017 by David.